The LT-1M or LT-1T Leaf Temperature Sensor is a thermistor style sensor with a clip to hold the sensor in contact with the leaf surface. The LT-1T is ideal for characterizing boundary layer conditions as well as providing an accurate measurement of leaf temperature at a local scale. Easy to install – simply clip onto a leaf within seconds. Easy to maintain – adjust on the leaf, or move to another leaf, as needed. Digital output: the LT-1T model has SDI-12 output to connect many sensors to a ES-SYS Logging System or to a wireless, LoRaWAN style system. Accurate measurements of a single leaf. The contact area of the thermistor is small at approximately 1 mm^2. The LT-IRM is an infrared style temperature sensor. 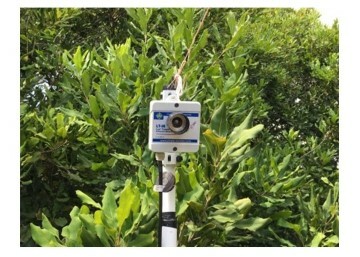 It is a non-contact sensor that can potentially measure an entire, or significant portion, of a plant canopy. The LT-IRM has a 3:1 field of view – for every 3 units of distance from the sensor, there is a 1 unit diameter field of view (FOV). Measure a large, or entire, portion of the canopy. 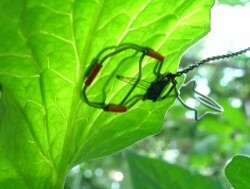 Non-contact with the leaf or canopy. Easy to install – simply mount on a pole and point at the plant’s canopy. Easy to maintain – adjust the field of view as needed. Digital output: the LT-IRM has SDI-12 output to connect many sensors to a ES-SYS Logging System or to a wireless, LoRaWAN style system. Flexible outputs: the LT-IRM also comes with analog (voltage), current (4..20mA) and RS-485 outputs. Emissivity, distance, environment temperature and atmospheric absorption must be noted.